NASA's Mars Exploration Rover Opportunity used its panoramic camera to capture this raw vista looking across Endeavour crater during the rover's 2,686th Martian day, or sol, of work on Mars (Aug. 14, 2011). This photo was taken three days after Opportunity arrived at the crater following a 3-year trek. NASA's Opportunity rover is beaming home snapshots from the ultimate Mars vista: the rim of a vast crater on the Red Planet. The latest photos from the Opportunity Mars rover, which NASA released Friday (Aug. 19), reveal a close look at the edge of Endeavour crater, a 13-mile (21-kilometer) wide scar where scientists are finding rocks with features never before seen by the long-lived rover. One of the four new photos of Endeavour crater released by NASA shows the ground around Opportunity's parking spot, revealing a rough surface littered with pebbles. But that view revealed a surprise to scientists. NASA's Mars rover Opportunity looked down at the dirt on the western rim of Endeavour crater to capture this view image from its panoramic camera during the rover's 2,686th Martian day, or sol, of work on Mars (Aug. 14, 2011). The view shows terrain unlike any other seen on Mars by the rover, NASA says. "The soil at this location has a different texture than any that Opportunity had seen earlier," NASA officials explained in a photo description. "Among other differences, this site has none of the iron-rich concretions, nicknamed 'blueberries,' which have been plentiful on the surface at many locations Opportunity has stopped." The so-called "blueberries" of Mars are tiny accretions of the iron-rich mineral hematite, which suggests they formed in watery conditions in the ancient past, NASA scientists have found. Another photo shows an eye-catching rock with a peculiar appearance. "The rock, informally named 'Tisdale 2,' displays a different texture than rocks that Opportunity has seen during the rovers' first 90 months on Mars," NASA officials explained. The flat-topped rock just below the center of this raw image from the rover Opportunity's panoramic camera was chosen by the rover team in August 2011 as a stop for inspecting with tools on Opportunity's robotic arm. This image was taken during the 2,688th Martian day, or sol, of Opportunity's work on Mars (Aug. 16, 2011), which was seven days after the rover arrived at the western rim of Endeavour Crater. The rock, informally named "Tisdale 2," displays a different texture than rocks that Opportunity has seen during the rovers' first 90 months on Mars. A third view of Endeavour is a postcard-like shot from Opportunity that looks across the vast crater to show its other side. In the last new photo, a huge rock that scientists have named Ridout dominates the rover's camera view. The large rock "Ridout" dominates this photo taken by NASA's Mars rover Opportunity on Aug. 13, 2011 near the rim of the giant Endeavour crater on the Red Planet. 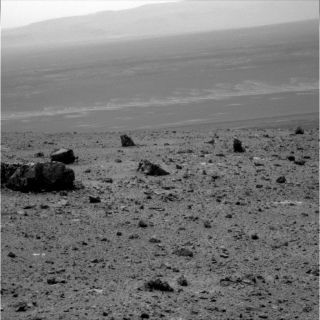 Ridout rock is on the edge of a smaller crater, Odyssey, on the rim of Endeavour. The Ridout rock is located on the northeastern rim of Odyssey crater and is as large as the Opportunity rover, which is 4.9 feet (1.5 meters) long. It is one of several rocks thought to have been ejected by the impact that created Odyssey crater, and which are expected to dominate Opportunity's attention for the near future. "Opportunity is now examining the ejected material from the small crater, named 'Odyssey,'" NASA officials said. "The rover is approaching a large block of ejecta for investigation with tools on the rover's robotic arm." The Opportunity rover is one of two NASA robots sent to Mars to explore the Red Planet simultaneously. Opportunity's robotic twin Spirit landed a few weeks before Opportunity and both lasted for years, though Spirit went silent in 2010 a year after getting stuck in deep Martian sand. NASA officially ended Spirit's Mars mission earlier this year after abandoning attempts to revive the rover. During that time, however, Opportunity has continued to perform as expected, but does have to drive in reverse because of wheel problems. A miniature thermal emission spectrometer on the rover has failed, and it keeps its robotic arm in a special position when driving due to joint issues, but for the most part the rover is doing well, mission scientists have said. Meanwhile, NASA is preparing to launch a new rover to the Red Planet: the Mars Science Laboratory Curiosity. The powerful rover, which is the size of a car, is due to launch in late November to explore a vast region called Gale crater and determine if it could have once been a habitable hotspot on Mars.